"My wife deserves vengeance. It doesn't make any difference if I know about it." When a filmmaker dares to screw with the logical narrative flow of a film, that director is taking a huge and dangerous risk. The standard linear order of a typical plot (beginning, middle, end) is what we, as movie viewers, have come to expect when we plop down to be entertained. It's rare when we encounter a film that challenges those preconceived expectations. Pulp Fiction, for example, featured a story that doesn't necessarily begin at the beginning or end at the end. It can be hopelessly unnerving for some to have this order scattered slipshod by some rebellious director. If you like your cinema nice and neat, then perhaps Christopher Nolan's Memento is not for you. On the other hand, if you appreciate a mentally challenging viewing experience, you will be hard-pressed to find a better contemporary example of against-the-grain film noir than this extremely clever thriller. Stripped down, Memento is a simple revenge thriller, with insurance investigator Leonard Shelby (Guy Pearce) seeking to kill the man who brutally murdered his wife and seriously injured him. The hook here is that Leonard's head wound prevents him from being able to make any new memories, and as a result he is forced to keep notes, take Polaroids or tattoo himself in order to recall important clues. Leonard's memories of anything new can only last a few minutes, and subsequently he has to rely on whatever notes he can take to direct his hunt for the killer. Nolan deconstructs and reconstructs the fabric of the film's timeframe by telling the entire story backwards. 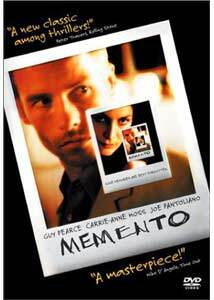 Working from the short story Memento Mori, penned by his brother Jonathan, Nolan (the director) begins at the end and slowly works his way to the beginning, with each scene occurring just before the following scene. As viewers, we know how the story ends at the beginning of the film, but we have no idea why. As the film progresses, backward toward the beginning, we learn tidbits of Leonard's life, and are introduced to a couple of potentially seedy characters that somehow figure prominently in his life: Teddy (Joe Pantoliano) and Natalie (Carrie-Anne Moss). Leonard's involvement with Teddy and Natalie, as well as his own recollections about a past insurance claim investigation concerning the case of a man named Sammy Jankis, all serve to eventually collide as Nolan drives the film toward it's source. Guy Pearce, soon to be experiencing more time-related problems in the remake of The Time Machine, conveys a beleaguered mix of paranoia and uncertainty as he slowly hunts down his wife's killer. His unique method of adapting to his affliction seems almost second nature to him, and Nolan's intentional absence of any exact timeframe between the murder and Leonard's hunt for the killer only adds to the weird level of deepening confusion. Image Transfer Review: We have a very crisp 2.35:1 widescreen anamorphic transfer from Columbia TriStar here. An exceptionally clean source print results in an image transfer that is practically free of any specks or dirt. Colors are warm, with a rather soft hue. Black levels are deep, and give the film solid shadow delineation, which is critical in film noir. Extremely minimal compression issues to contend with on this one. Audio Transfer Review: Memento is the kind of film that jars you mentally, and the Dolby Digital 5.1 surround track also lulls you along until it erupts in a swirling soundscape. Consequently, the rear channels have a tendency to lie dormant for awhile before adding depth to a flashback scene or a recalled memory, which really add to Nolan's dramatic punch. This isn't the kind 5.1 mix that will become a reference disc, but it is so subtle and startlingly effective that it only adds to the film's general tone of confusion. The second audio track is a 2.0 surround mix, which sounds pretty good overall, but lacks some of the more refined elements of the 5.1's imaging capability. A less than completely informative interview of Nolan, hosted by IFC's Elvis Mitchell. Nolan touches on some of his own memory issues, as well as the film's origin as a short story by his brother Jonathan. Christopher Nolan seems like the type of director that could provide a terrific non-stop commentary narrative, and I hope that sometime in the future we get to hear one from him. This segment allows viewers to analyze the various tattoos that Leonard has, presented via split screen as both illustration and actual tattoo. Full text of the short story Memento Mori, written by Christopher Nolan's brother, which served as the basis for the film. If you have seen the visually impressive Memento website (www.otmenem.com), then you will have already seen this section. A newspaper article provides strange links to a series of photographs that tie into the film, and also fills out some character details. This is very, very cool. A full-frame theatrical trailer and TV spot, as well a trailer for Nolan's first film Following are included. The menu for this disc eerily matches Leonard's confusion. Images appear, then disappear, while the sound (which has excellent surround effects, especially for a menu). UP arrows move down, DOWN arrows move up. I'm not a big fan of clever, involved menus, but this so perfectly fit the film that I can't really say anything bad about it. Spanish subtitles, and 19 chapter stops complete the extras. Director Christopher Nolan takes film noir to an entirely new level with Memento, and creates a wonderfully off-balance viewing experience. This is that rare type of clever and exciting filmmaking that grips the audience with an exhilarating rush of confusion, uncertainty and paranoia. A real mind-bender. Despite the lack of a director's commentary (and the much hoped for sequential edit) there is still a nice array of quirky supplementals add to the strangeness.